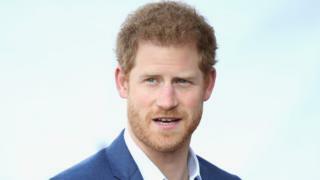 German officials are changing a school English exam which many students and teachers deemed too difficult - partly because it included a poor recording of Prince Harry "mumbling" in a speech. The decision in the most populous state - North Rhine-Westphalia - came after an online student petition collected more than 43,000 signatures. Students also complained about a question on Apartheid in South Africa, which had difficult vocabulary. For many it was a very important exam. It was part of the state's middle-school leaving exams, taken by 16-year-olds, and counted for half of all the marks in English. The marks obtained in those exams usually determine what sort of apprenticeship students can do after secondary school. In light of the complaints, the English exam marks are being revised. Different leaving exams, called the "Abitur", are taken by students at Gymnasien - schools more geared towards higher education. Dario Schramm, 16, launched the online petition on Thursday, and it quickly drew thousands of signatures, German media reported. Commenting on the Prince Harry speech, he complained that there was "loud background noise". The prince gave the speech on Aids at a children's centre in Lesotho in 2015. A headmaster in Düsseldorf, Bernd Hinke, was quoted as saying: "Some students were extremely upset, there was weeping and great disappointment".